"Liberate the horizontal. Integrate the vertical super-surface." See you in the branches. International Tree Climbing Day is a project by the Duo Collective (Kayle Brandon and Heath Bunting). Formed in 2002, Duo produced a range of projects, in terms of duration, formality and resources. Some where short, messy and cheap, others where long, expensive and structured. "As the SF Board of Supervisors prepares to vote on a law that would make it illegal to sit or lie on any sidewalk in the city, San Franciscans from all walks of life will respond by participating in a creative celebration of the city’s public space, culture, and tradition of compassion. On Saturday, March 27, people in every neighborhood will be doing what they love on the city’s sidewalks and they will be inviting family, friends, and neighbors to join them." "Passionate individuals and non-profit organizations from the region of Rennes, Brittany, France invite you to participate in the first Breizh Entropy Congress. This inter-disciplinary event focuses on free (as in freedom) creations and culture. Through a meeting fostering open-mindedness, exchange of ideas and learning, we hope to show solutions to technical, social and political problems, and celebrate free, reclaimed and creative art and technology. We happily welcome entropy, as a means to break artificial boundaries between disciplines and find unexpected ways of doing things that promote liberalization, sharing and reclaiming of technologies that traditionnally belonged to the realm of corporations and well-funded academic labs." Art Work is a newspaper and accompanying website organized by Temporary Services. It consists of writings and images from artists, activists, writers, critics, and others on the topic of working within depressed economies and how that impacts artistic process, compensation and artistic property. Migrating Gardens is a collaborative project by Oda Projesi and Nis Rømer reflecting on the relation of micro-scale farming and migration. It is an investigation of why people move from one environment to another and how they manifest themselves in the city with their practices/professions from where they come from. It takes place in the whole of October, with events, cycling tours and a free news paper that you can download here. An outdoor, free exhibition that takes place on the spactacular coastal walk between Bondi and Tamamrama Beach in Sydney. Entry forms can be downloaded directly from the site. Entries close April 20! The exhibition will take place from October 29 - November 15. A conference on "Sculpture in Public Space" will take place November 2. International entries welcome. Bound Together Bookstore presented the first Bay Area Anarchist Book Fair on March 30, 1996. The event was organized to celebrate the 20th Anniversary of Bound Together, and took place in the San Francisco County Fair Building in Golden Gate Park near Ninth Avenue and Lincoln Way, where the event is still held annually today. The 14th Annual Bay Area Anarchist Book Fair will be held on March 14th and 15th, 2009. Admission is free. We have just occupied New School University. We liberate this space for ourselves, and all those who want to join us, for our general autonomous use. We take the university in explicit solidarity with those occupying the universities and streets in Greece, Italy, France and Spain. This occupation begins as a response to specific conditions at the New School, the corporatization of the university and the impoverishment of education in general. However, it is not just this university but also New York City that is in crisis: in the next several months, thousands of us will be losing our jobs, while housing remains unaffordable and unavailable to many and the cost of living skyrockets. "A site where anyone with an internet connection can watch a movie to educate themselves or simply explore another perspective whenever they please. These movies aren't just for education but are also for entertainment. As a secondary objective freedocumentaires.org allows independent filmmakers to have their message heard by viewers that they may not normally reach." Code magazine intends to fill the gap by offering a platform to the young contemporary creation and its actors. Code is a free magazine published by a collective of curators. It aims at introducing new forms of expression as well as to raise the interest of the public for an exciting and innovating culture. Code is also a curatorial project. In order to offer artists the best conditions in which to present their work, Code regularly curates collective shows. For nearly 40 years professor in geography: David Harvey has been doing a much talked about course consisting of a close chapter to chapter reading of Karl Marx's Capital. The whole course is now online as 13 videos to be viewed in your browser or downloaded as sound or video. The current issue evolved from the two-day conference Aesthetics and Politics: With and Around Jacques Rancière co-organized by Sophie Berrebi and Marie-Aude Baronian at the University of Amsterdam on 20 and 21 June 2006. A transcript of the keynote lecture ‘Aesthetic Separation, Aesthetic Community: Scenes from the Aesthetic Regime of Art’ delivered by Rancière to the conference on 20 June is published here for the first time. Sometimes confused if you are at an art fair or in a shopping mall? Two art fairs in Copenhagen and London gives you a break. 1968 was a world revolution. From Mexico City to Tokyo, Paris to Prague, Columbia University to Berkeley, it was a revolutionary event that at once failed and transformed the world. The process it put into place continues today. 1968, the long '68, altered fundamental balances of power and set the stage for today's new movements. '68 was a great rehearsal. For what, it is up to us to decide. The Global Commons Foundation, PM Press, and Historians Against the War invite you to a week of discussions and events on the worldwide events of 1968 and their legacies. A gathering every Tuesday to eat delicious, healthy soup and have fresh, organic conversation about many of the urgent social, cultural, economic, and environmental food issues facing us all. Please join us in the historic Residents' Dining Hall, where Upton Sinclair, Ida B. Wells, W.E.B.DuBois, Gertrude Stein and other important social reformers met to share meals and ideals, debate one another, and conspire to change the world. Activists, farmers, doctors, economists, artists, and guest chefs will join us each week to present their ideas and projects. It has been a while since i posted, and I remember when we first started this blog that one of the criteria was to post all things "free". So here is a lovely festival if you are in Belgium. Futurefarmers in collaboration with the Peggy Notebaert Nature Museum will host two building workshops and 4 discussion sessions led by scientists from the University of Chicago. The general public will be invited to participate in discussions with the guests in the Energy Tent. Public Collectors consists of informal agreements where collectors allow the contents of their collection to be published and permit those who are curious to directly experience the objects in person. Participants must be willing to type up an inventory of their collection, provide a means of contact and share their collection with the public. Collectors can be based in any geographic location. The purpose of this project is for large collections of materials to become accessible so that knowledge, ideas and expertise can be freely shared and exchanged. Public Collectors is not intended, nor should it be used, for buying and selling objects. There are many preexisting venues for that. Mediamatic.net will give away all its books. They cancel their library in protest to skimpy Dutch art funding policy. All members of the mediamatic community (and other book lovers) can pick up their favorite books for free. You just have to publish the ownership on your profile. And promise that you will always honor a lending request from an other community member. Et voilá, a distributed library. First come, first serve. They have a library with thousands of books, magazines and multimedia. Once again The Journal of Aesthetics and protest Press brings us "an emblematic, ambitious, and inspiring online project": In the Middle of a Whirlwind: 2008 Convention Protests, Movement and Movements. Coordinated by the editorial collective Team Colors, Whirlwinds provides a set of useful documents for contemporary radical organizing. Each essay and interview addresses the issues of fulminating power, and gives strategic insight into the strengths and weaknesses of current movement/s in the U.S. Whirlwinds’ strategic context is this summer’s RNC and DNC protests. The Free Farm Stand is an all volunteer grass roots effort whose goal is offer a place where urban farmers and gardeners can share their harvest of vegetables, fruits, and flowers with others, especially those on low incomes and tight budgets. They make locally grown, organic food accessible to all as much as possible by encouraging neighbors to grow some of their own food and turn vacant lots into garden plots and turn gas stations into plantations. The Free Farm Stand offers free organic produce & free flowers free seedlings & starts free garden advice a place to drop off locally grown or gleaned organic food & flowers. John Emerson, collector of inspiring notes on design and the public interest, wrote and designed a booklet to introduce advocacy organizations to basic principles and techniques of information design. It’s full of examples of interesting design from groups around the world in a variety of media and forms. It has tips, excercises, and even recommended Free Software packages to help polish up your graphics. The booklet is Creative Commons licensed and fully downloadable. "The Audacity of Desperation is an art exhibition, political action, and on-going dialogue. This show confronts, expresses and unravels states of desperation. Artworks by activists, artists, enthusiasts, and very concerned people, are made in editions of 100 with the intention of free distribution to audiences. In this way, these artworks will be activated outside of the exhibition space and in domestic spaces, on bodies, clothes, bags, and in public spaces." May 7th - June 15. RadicalMath is a resource for educators interested in integrating issues of social and economic injustice into their math classes and curriculum. On this website you will find links to access and download over 700 lesson plans, articles, charts, graphs, data sets, maps, books, and websites to help you bring these issues into your classroom. "Guide for Integrating Issues of Social and Economic Justice into Math Curriculum". The culture that we all create should not be owned or privatized by corporations. The instrumentalisation of art and culture for economic gain is an invasion of our life worlds that needs to be addressed and countered. We will produce with lust for life and dance on the graves of the bloodsuckers from the creative class and the experience economy. "The International Institute of Social History was founded in 1935. It is one of the world's largest documentary and research institutions in the field of social history in general and the history of the labour movement in particular. Most of the collections are open to the public. The IISH holds over 2,700 archival collections, some 1 million printed volumes and about as many audio-visual items. The available collections are accessible through an online catalogue, an online index of archives and inventories. The IISH carries out and stimulates scholarly research. It is a respected meeting place for researchers from all over the world and organizes conferences, symposia and international research projects. The Institute publishes research results through international academic publishers and its own inhouse publishing unit." "Good Copy, Bad Copy" is a terrific new documentary about copyright and culture, directed by Andreas Johnsen, Ralf Christensen, and Henrik Moltke. It features interviews with Danger Mouse, Girl Talk, Siva Vaidhyanathan, Lawrence Lessig, and many others with various perspectives on copyright. A large collection of extended essays, critical articles, interviews and film reviews focussed on contemporary Central and European visual culture. Archived from 1999 up till today. Formed in 2000 by scientists and physicians, PLoS is a non-profit organization committed to making the world's scientific and medical literature a freely available public resource. "PLoS publishes peer-reviewed, open access scientific and medical journals that include original research as well as timely feature articles. All PLoS articles are immediately freely accessible online, are deposited in the free public archive PubMed Central, and can be redistributed and reused according to the terms of the Creative Commons Attribution License." Prefuse is a set of software tools for creating rich interactive data visualizations. The original prefuse toolkit provides a visualization framework for the Java programming language. The prefuse flare toolkit provides visualization and animation tools for ActionScript and the Adobe Flash Player. SHARE is an organization dedicated to supporting collaboration and knowledge exchange in new media communities. Local SHARE groups hold free, open jams and workshops in their communities. Participants bring their portable equipment, plug into our system, improvise on each others' signal and perform live audio and video. SHARE furnishes the amplification and projection, and happens weekly to monthly in cities around the world. Interested in starting a gathering? See the do it yourself page. SAFE, the Society for Agriculture and Food Ecology is a group initiated by students at UC Berkeley who catalyze honest discussion of a truly sustainable food system. Through panels, speakers, events and workshops they bring this discussion onto their campus with the intention of being inclusive, productive and impassioned on behalf of thier common goals of agricultural sustainability, ecological integrity, healthful human nutrition and vibrant rural economies. "We feel strongly that this discourse is a critical element in the formation of policy goals, urban consumer literacy, and the shaping of food science. We also hope to embolden those interested in food/farming to make a career in these fertile fields." They have also organized The Local a market stand featuring fresh local produce on UC Berkeley Campus once a week. The Copy South Research Group was established in December 2004. It is a loosley-affiliated group of researchers based in a number of countries across the South and the North who seek to research the inner workings of the global copyright system and its largely negative effects on the global South. The entire group first met together in August 2005 at the University of Kent in Canterbury, United Kingdom for a 'by invitation only' workshop. Its first publication is the Copy/South Dossier. The MediaShed is the first "free-media" space to open in the east of England. It's a place where members can come hang out, learn, propose some training, create and propose new projects using free-media or show things they have made on one of our screening nights. The MediaShed is designed to be as open and accessible as possible, welcoming all. Free-media is best thought of as a means of doing art, making things or just saying what you want for little or no financial cost by using the public domain, free software and recycled equipment. It is also about saying what you want "freely", using accessible media that can be taken apart and reused without unnecessary restrictions and controls - "free as in free speech". An Unnatural History of Golden Gate Park is an audio tour that strolls through Golden Gate Park exploring the ways in which the park represents changing ideas of nature in the city. The piece is considers the important role that this evolving landscape plays in the social and ecological life of San Francisco. The project is being presented as part of the Open Skies Festival, October 19 - 21, 2007. "A Freeconomy is a moneyless society in which no money changes and there is no duality between giving and receiving; here they are seen as the two sides of the same non-monetary coin. Freeconomy is about sharing the skills you've learnt throughout your life and learning those you haven't. It's about helping others and providing an opportunity for others to help you. Freeconomy allows people to make the transition from a money based communityless society to more of a community based moneyless society, and to share the land they don't need or can't use to facilitate a local food community." "Gearbox is the outcome of twelve-months development work between the MediaShed and Eyebeam Art and Technology Centre in New York, to create a resource for low-budget filmmaking. Comprised of “how to” step by step examples, Gearbox shows people innovative ways of recording footage using unusual combinations of found resources (such as CCTV Video Sniffin' or Spy Kiting) and low-budget methods of reproducing professional film making techniques (for example, achieving a crane shot using a fishing pole). The MediaShed is the first “free-media” space to open in the East of England and is located at the mouth of the Thames. It's a place for doing art, making things or just saying what you want for little or no financial cost by using the public domain, free and open source software, recycled equipment and enthusiasm. It's also a place to say what you want “freely”, using accessible media systems that can be taken apart and reused without unnecessary restrictions and controls." Presented by Iain Boal, a member of Retort and one of the authors of "Afflicted Powers" Afflicted Powers is an account of world politics since September 11, 2001. It aims to confront the perplexing doubleness of the present—its lethal mixture of atavism and new-fangledness. A brute return of the past, calling to mind now the Scramble for Africa, now the Wars of Religion, is accompanied by an equally monstrous political deployment of (and entrapment in) the apparatus of a hyper-modern production of appearances. Retort is a gathering of antagonists to capital and empire, based for two decades in the San Francisco Bay Area. The present book arises from the group's efforts to confront the current political moment and some of the main forms of resistance to it. Involved in the writing were Iain Boal, T. J. Clark, Joseph Matthews, and Michael Watts. Art & Research is new, artist-led internationally peer assessed journal which welcomes submissions from artists, researchers, academics, critics and curators which seek to engage with all areas of research in Fine Art practice and/or pedagogy. As a flagship station of the American public radio network, WNYC, New York Public Radio's mission is: "To make the mind more curious, the heart more tolerant and the spirit more joyful through excellent radio programming that is deeply rooted in New York." A Really Really Free Market is like a potluck for whatever you want to give or take away. Have you ever brought one dish to a potluck and gone away with a full belly and a balanced meal? Everybody brings something and goes away with more. We all have skills, ideas, objects, smiles, talents, friendship, excitement, discussions, and many other things to share. If we bring them all together at the Really Really Free Market, we can provide more balanced and full lives for everyone. The Really Really Free Market is an attempt to put these ideas into practice for four hours every month. History Is A Weapon is a left counter-hegemonic education project and offers a nice collection of texts focussing largely on American resistance history. The list of online readings covers a wide range of great authors and is organized in chapters. The blog serves to highlight updated material and offer sporadic commentary. The Street training manual is the latest in a series of manuals and publications by Lottie Child that can all be downloaded from her website. She works with collective and direct action, play and the politics of public space. She also devises urban explorations in order to collectively produce guides for active engagement with urban places. She invites specific people to share their expertise and subjective responses to the notions of freedom of movement and anti social behaviour in increasingly sanitized and controlled urban places. A publication addressing issues in the economics, politics, and ideology of copyright in the global South. The Copy South Research Group is a loosley-affiliated group of researchers based in a number of countries across the South and the North who seek to research the inner workings of the global copyright system and its largely negative effects on the global South. This is a real resource for people interested in alternative city development and research. Editors and authors Jochen Becker and Stephan Lanz and others have made publicly available major parts of their writing on Cities like Istanbul, Teheran, Farvelas in Rio and more. Among the books are "City og COOP", and "Space // Troubles". The books continue a strong German tradition for alternative but thoroughly researched urban investigations. A free, online journal aiming to promote, maintain, improve and advance the education of the public particularly by the encouragement of the Arts including (but not limited to) the arts of drama, dance, music, singing, literature and visual arts. The Bank of Common Knowledge is organized as an open source model of knowledge transfer, a laboratory for inventing and trying out new forms of production, education, organization and distribution, involving new roles for producers and receivers, experts and amateurs, teachers and students, as well as new relationships between the production of image, text, and audio material and their subsequent diffusion in the public space. Browsing the contents of a new acquaintance's bookshelves is a common impulse. I do it all the time, sizing people up, looking for common interests, potential conversation starters, and, I guess, ideas for something to read next. It can take some time to meet all of your acquaintances' bookcases, but on Sunday, April 15th, 2007 an event for public book sharing was held at the Garden for the Environment. The garden is a seventeen-year-old space headed by Blair Randall, and offers the local community resources for growing things. Amy Franceschini, the demonstration garden's first Artist in Residence, initiated the One-Day Library, a social gathering to further interest in urban gardening and related ideas. A simple bookcase (milk crates and boards) was set up in the garden-- its bare shelves awaiting the arrival of books. Library attendees were invited to bring selections from their personal libraries about urban gardening, food history, art and nature, and related ideas. Together, more than fifty attendees created a new library. It could be assumed that attendees were veritable green thumbs, but hardly a word was traded about how to grow a specific bean. Instead, the majority of talk amongst the artists, educators, and students was about how to encourage gardening, the local politics to support urban gardening, and the wealth of things published in recent history about the matter—topics of conversation that surprisingly don't rule out the participation of those who kill most of what they plant. The collective library was one of both old gems and current discourse. Some books had been found in garage sales from decades past. University course readers, small press, underground and local publications sat alongside how-to guides, non-fiction paperbacks, essays about biology, mushrooms, and the urban environment. I found my own favorites in a dictionary-style book of pretend locations, and a book of illustrations explaining the world of utilities underneath the street. The One-Day Library readers paid dues to some other offbeat subjects. Contributors to the library were welcomed to read passages aloud from their books. Those who read shared relevant ideas. A few provocative thoughts go nicely with donated bread, baked goods, tea and a little wine especially on a bright day surrounded by flourishing vegetation. Amy Balkin read a selection from a 1974 children's cookbook shedding light on a long-forgotten dietary supplement promised by the UN to end protein deficiencies worldwide. Seemingly, the supplement called "CSM" never lived up to the language used to triumph its saving powers, and one has to wonder whether writing to the address in the book for a free sample would yield anything at all. Megan Shaw Prelinger shared her connection to the land via mushroom hunting by reading from David Wolfe's Tales from the Underground. Rick Prelinger also of the Prelinger Archives and Library introduced an educational film from the 50's titled, Our Foster Mother the Cow, allowing younger imaginations to conjure exactly what kind of teaching went along with rural agricultural lesson plans. Henrik Lebuhn read a worthwhile selection about sleeping in public from A Pattern of Language by Christopher Alexander. And, Ian Boal arrived in time to take his shoes off and read from The Country in the City, a just published book exploring the environmental disputes behind the green spaces that now make up the Bay Area. The One-Day Library found success in its temporary nature as a public event, for me, because the image of a collective bookcase resonates even though it has already been taken down, and all the books have gone home with their rightful owners. The act of creating a dream library out of both book owners and the books beats the traditional lending library at usefulness and approachability — the indispensable part being people who can talk about the books they brought. Building such a library ultimately works to recognize one's own community as the most necessary resource we have. A new electronic reference about the Earth, its natural environments, and their interaction with society. The Encyclopedia is a free, fully searchable collection of articles written by scholars, professionals, educators, and experts who collaborate and review each other's work. The articles are written in non-technical language and will be useful to students, educators, scholars, professionals, as well as to the general public. .. somehow this URL gives a Error 403 message today 04/11/07, but I will leave the info up anyway. "BugMeNot.com was created as a mechanism to quickly bypass the login of web sites that require compulsory registration and/or the collection of personal/demographic information (such as the New York Times, YouTube, .. etc)." A one-day public library created by artists, gardeners and friends of the Garden for the Environment. Invited, one and all, to bring a selection from your private library to the garden for a one-day only public library. By sharing a selection of your favorite books we will temporarily create a collective dream library. Please bring no more than ten books on the following themes: Urban gardening, art and nature, food history, art/policy/farming, sustainability/self-reliance, future of food, social history of food/gardens. Books can be children's books, non-fiction, how-to guides, scientific/botanical illustrations, recipe books, zines and fiction. Come prepared to read, sip tea and share selections from your favorite books. If you cannot make it, we will create an online archive at Library Thing. Hanne Mugaas and Cory Arcangel are concerned with the Internet and its possibilities for archiving and distributing information. Art history uploaded to the Internet is certainly an alternative one...Based on user generated content, the Internet has become a unique channel of distribution where the responsibility of interpretation lies in the hands of the receiver and his/her ability to sort out and analyze the given information. For this event, Mugaas and Arcangel will sort and collect images, video, and audio from the Internet in order to discern where art and art history on the web is situated right now. Wikipedia's description of 'Gleaning' is the collection of leftover crops from farmers' fields after they have been mechanically harvested or on fields where it is not economically profitable to harvest. "Glean The Planet is a community resource to facilitate the sharing of food. Gleaning is about sharing food resources that would otherwise go to waste. Whether you are looking for free vegetables or have an apple tree you don't have time to pick from, you can use GTP forums to spread the word." "The phrase ‘open education resources’ encompasses several different types of resources, including learning content, tools and implementation resources; and iCommons has developed a short list that contains the major Open Education Resources on the internet. Incubated by Creative Commons, iCommons is an organisation with a broad vision to develop a united global commons front by collaborating with open education, access to knowledge, free software, open access publishing and free culture communities around the world." Yesterday, the monthly kino21 series started off at ATA with a new English version of Society of the Spectacle (France, 1973), Guy Debord's fourth film. It uses a soundtrack of excerpts from his most reknowned Situationist text "La societé du spectacle " and a collage of documentary, still image and detourned movie clips. Ken Knabb's translation - among many other texts and pamflets by the Situationist, Karl Marx, Bertolt Brecht, ...etc - can be found on the amazing Bureau of Public Secrets website. Environmental Defense, a national nonprofit environmental advocacy group founded in 1967, launched Scorecard in 1998 as a free resource. It now contains information from over 400 scientific and governmental databases about pollution problems and toxic chemicals. Scorecard allows US citizens to find out about the pollution problems in their community and learn who is responsible. "The Digger Archives is an ongoing Web project to preserve and present the history of the anarchist guerilla street theater group that challenged the emerging Counterculture of the Sixties and whose actions and ideals inspired (and continue to inspire) a generation (of all ages) to create models of Free Association. The Diggers combined street theater, anarcho-direct action, and art happenings in their social agenda of creating a Free City. Their most famous activities revolved around distributing Free Food every day in the Park, and distributing "surplus energy" at a series of Free Stores (where everything was free for the taking.)" L’Alliance pour la Planète, a collective made up of NGO's and associations in France, is calling out to Parisian and all European citizens to turn of their lights for five minutes on February 1st. The date is choosen because a new report will be submitted in Paris the next day by GIEC, an intergovernmental group of experts on climate change for the United Nations. The '5 minutes of respite' are meant to attract the eyes of the media, and show the French presidental candidates that global climate change must be included in the political debate. Stephanie Smith and the Smart Museum have made the "Beyond Green" catalogue free for download. Contains contributions from Free Soil, Temporary Services, Dan Peterman, JAM and many more. The website is only available in Flemish, but "Ruimte te gebruiken", using clear real estate imagery, sort of translates into "Space for you to use". With this project, Marthe Van Dessel facilitates 1000 square meters at Art Centre Z33 totally free for a weekend. Organizations and individuals can apply for a 'piece of property' that includes all logistics like a film theater, a stage, audiovisual equipment, a complete museum staff and of course .. a deep fryer. A plethora of places, spaces and oddities. "Border crossings" are especially interesting! "A visual encyclopedia that documents manufacturing processes, labor conditions and environmental impacts involved in the production of contemporary products. As an independent, academic, wiki-based publication, HSIM reconsiders engineering and design education as fundamentally connected to the social and political constraints, organizational innovations and global context that inform manufacturing decisions." A network of couches and houses open to travelers. When you surf a couch, you are a guest at someone's house. They will provide you with some sort of accommodation, a penthouse apartment or maybe a back yard to pitch your tent in. Stays can be as short as a cup of coffee, one night or a few months. When you offer your couch, you have complete control of who visits. "This soil and the airspace extending above it shall not be a part of any nation and shall not be subject to any entity's jurisdiction." This project was winner of a national public art competition to commemorate the Free Speech Movement at UC Berkeley. It uses the political process to create a space free from any outside jurisdiction. A six inch column of land and airspace are legally redefined as not being a part of any nation, state or city therefore no laws are applicable within the small space. A granite ring surrounds the land and bears the inscription above. 'Slightly' different from National Public Radio, this NPR is an independent, artist-run radio project committed to providing an alternative media platform for artists, activists, musicians, and community members. Check out their most recent broadcasts. The name derived from the 1975 Ant Farm event, this beta version of the archive already comprises an amazing collection of over 35 years and over 4,000 hours of independently produced, non-fiction/documentary videotapes. Media Burn is a project of the Fund for Innovative TV (FITV) and aims for a widespread distribution of independent media. 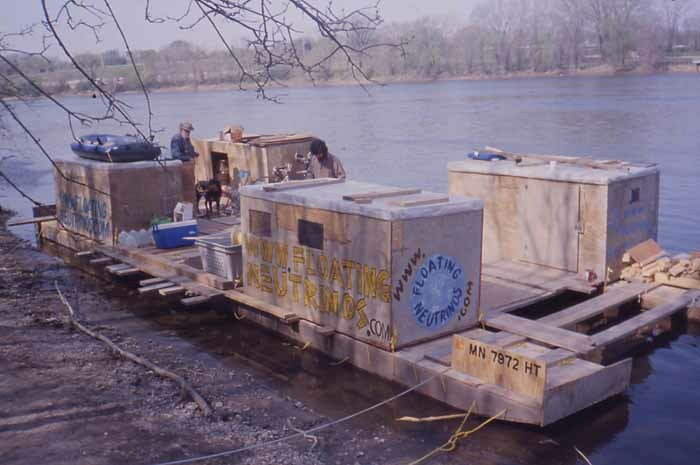 Modern day Mark Twain... a raft made from trash and biodiesel engine floats down the Mississippi equip with solar ovens, a bicycle-powered sound system, wind-powered lights, and rain water collectors. The Floating Neutrinos are creating and demonstrating viable alternatives to modern tendencies toward imitation, factory made consumerism, and loss of individual creativity. NetAction's self-guided training course shows you how to strategically use technology to enhance grassroots organizing and outreach efforts related to political campaigns and public policy issues. As a matter of drifting from the previous post a site most recommendable is University of Openness, one of the first art sites (that I know of) to have used a wiki effectively to make self organized projects. Especially the Cartography section offers a wealth of information and check the urban climbing section run by Lottie Child. Phantom Captain at Apexart, explores art collaboration that involves amateur groups of individuals responding to “crowdsourcing” initiatives created by artists. The term crowdsourcing refers to “user-generated content,” or outsourcing labor to armies of amateurs. A free and open educational resource (OER) for educators, students, and self-learners around the world. Visit the main MITOPENCOURSEWARE for more. California College of Art’s Center for Art and Public Life is hosting the symposium, Crafting a Vision for Art, Equity and Civic Engagement: Convening the Community Arts Field in Higher Education to highlight artists’, scholars’ and students’ experiences by exchanging the best practices in the field. MediaRights is a community organization dedicated to maximizing the impact of social-issue documentaries and shorts. They help adult and youth filmmakers reach audiences, educators and librarians bring films into their curricula and nonprofits and activists integrate media into their campaigns. The People's Free Space is a community organization based in Portland, Maine whose mission is to create autonomous collective spaces for sharing information and resources, building community, and fostering sustainable alternatives and creative resistance to social, economical, political, ecological oppression. It is our belief that education is an essential component of building a stronger, informed and connected community. La Loko means ‘the place’ in Esperanto. It is a project initiated and run by international artists Olof Olsson and Daniel Salomon. They are working with the language of Esperento, which was created by Ludwik Zamenhof in 1887 to be a neutral language which was easy to learn, so different speech communities could communicate instead of fight. This summer they were lobbying to make FIFA accept an international Esperanto football team. And just recently they launched a new non-national sausage company in Reykjavik. Kolbasoj sen Limoj is Esperanto and means ‘sausages without borders’. The company will make non-national sausages of the highest quality. "In 2003 Andrea Creutz and Lise Skou, initiated the project swop network as a platform for production and dissemination of materials and ideas surrounding contemporary political, economic and social debate. The project has grown into different initiatives that vary from distributing a free paper, establishing a currency called 'Hidden Flow' Currency, opening a Give Away Shop, and more." Free access to wonderful content; Free Range Practice Guides, Buying Collectively, and Protesting in Public to name a few. A conference bringing together scholars, communards and cooperators, past and present, to explore the history, daily lives, and legacies - cultural, political, artistic, architectural - of the flowering of communalism in the 60s and 70s in the Bay Area and its hinterland. West of Eden will take place on Saturday, March 25th, 2006 on the UC-Berkeley campus and is hosted by the Department of Geography and the Institute of International Studies. Free Walking is about going on walks together. Or, you might say, it is about the shared experience of exploring places on foot. By giving freely with no strings attached, members of The Freecycle Network help build a worldwide gifting movement that reduces waste, saves precious resources & eases the burden on our landfills while enabling our members to benefit from the strength of a larger community. "diy: self survival" collated by c6.org is now available for cheap and can also be downloaded for FREE from their website! studies showing the breadth and current diversity of art/activism practice today from around the world. Evans, Mika Raento, Theo Humphries and the fantastic Ryan Griffis! Bozo Texino is a 56min documentary on the secret history of hobo and railworker graffiti, called WHO IS BOZO TEXINO? Shooting over a period of 16 years, Bill Daniel rode freights across the west gathering interviews and clues to the identities of many of the most legendary boxcar artists while discovering a vast underground folkloric practice that has existed for over a century. Bozo Texino embraces "a subculture of men who, by choice or necessity, slip beneath society's radar and adopt a rootless existence, free of social security numbers and the bonds of wage slavery. In a political climate where welfare mothers receive the full brunt of opprobrium from upper and working classes alike, few are aware of this liminal network of rail-riding hoboes, whose names are not recorded in the files of state-assistance bureaucracies." A celebration of bicycle culture through music, film + art! The festival is currently rolling through San Francisco. Brought to you by our brother: Brendt Bryant Barber and friends! Check out the photos- bicycle barbeque! In late 2004, the Australian government formed the Redfern Waterloo Authority (RWA), and granted itself sweeping powers to displace residents and pave the way for urban renewal in the area of Redfern and Waterloo. The Squatspace gallery and collective is offering 2 FREE bus tours of the area, giving a feel for what these changes will mean for the local indigenous community that lives there. Squatspace themselves have a colourful and important place in the history of squatting and artistic infiltrations in Sydney. SUV Ads and the Consumption of Nature"
Humans and Nature in Bambi and The Lion King"
FREE WORDS is a book which belongs to whoever finds it. 2500 copies have been distributed worldwide. It's simple.! If you have up to date wheather information and detailed maps including altitude, ... you can also have a route-finder that takes wind direction and hills into account. How great is that.! Test it through this web interface. "The mission of the Free Culture movement is to build a bottom-up, participatory structure to society and culture, rather than a top-down, closed, proprietary structure. Through the democratizing power of digital technology and the Internet, we can place the tools of creation and distribution, communication and collaboration, teaching and learning into the hands of the common person ## and with a truly active, connected, informed citizenry, injustice and oppression will slowly but surely vanish from the earth." Artist well worth checking out, on the webpage you can download his book, with texts by Bourriaud, Lars Bang Larsen and others. This is an amazing ressource and book, there is an online version free to read. "Coined in 1999, the term ecovention (ecology + invention) describes an artist-initiated project that employs an inventive strategy to physically transform a local ecology"
For the Garage festival 09 Free Soil have conducted a site specific research project investigating the environment of the Baltic Sea. Portrait of William Lindley the designer of the first sewerage system in Stralsund, algae on paper. Svarlamoen is a self-organized area in Trondheim, Norway, experimenting with new ways of building and living. In the centre back you see the low energy wooden high house. Far back are submarine bunkers from ww2.